Hanukkah begins this Sunday Night, Dec. 2nd, 2018 and continues through Monday, December 10th, 2018. We have some fun ideas for you to celebrate on Long Island and enjoy the festivities at home with your family and friends. Two great 1-hour workshops to start the holiday season! Menorah Workshop is from 12:30-1:30, followed by Sea Glass Ornaments from 2:00-3:00 pm. Each workshop is $12 per participant (accompanying adults just pay museum admission), or do both for $20! Each workshop limited to 30 participants, first come first served (no advance registration needed). *Menorah & Dreidel Building, Magic, Face painting @Home Depot! Get Out Your Building Skills! Come with Your Family, Relatives & Friends! Help Them Build Their Own New Wood Dreidel and Menorah With The Guidance, Talent & Skill of The Home Depot Menorah Builder Pro’s. & Special Home Depot Designed Menorah and Dreidel Materials! FIRST NIGHT Menorah Lighting, Magic show, Face painting, Cotton candy, Donuts, Music Sponsored by The Home Depot. Must RSVP to Join the Program! Sunday, December 2nd. 4:00-5:30Pm @ The Home Depot. Join the Holbrook Chamber of Commerce at our annual Menorah Lighting in front of the Coste Agency & Spies Travel. Rabbi Moss will lead us with songs & prayers. 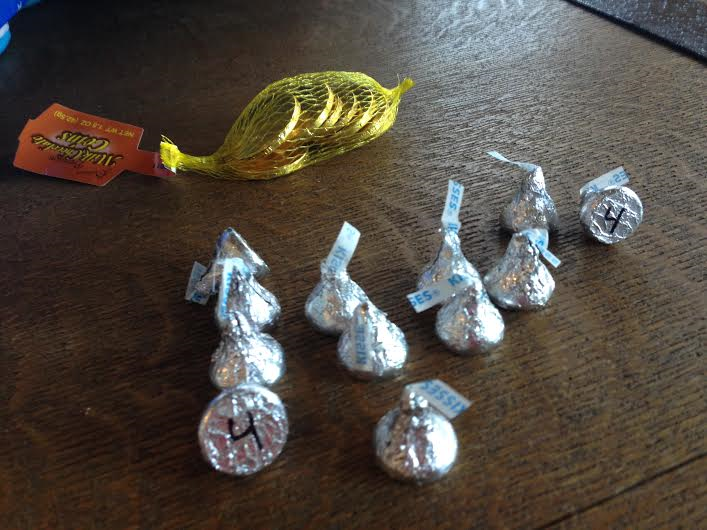 Children will receive Chanukah gelt! What I love most about the holiday season is gathering friends and family together for lots of fun games and activities. 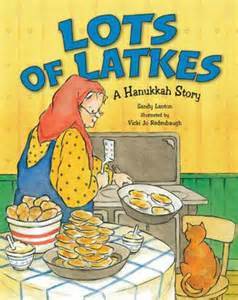 by Sandy Lanton, illustrated by Vicki Jo Redenbaugh is a Hanukkah story. From one Momee to another I think this is a great story to share with your family this holiday season. Keeping with the marshmallow desserts we decided to attach some Hershey kisses to the end of the marshmallows using melted chocolates. 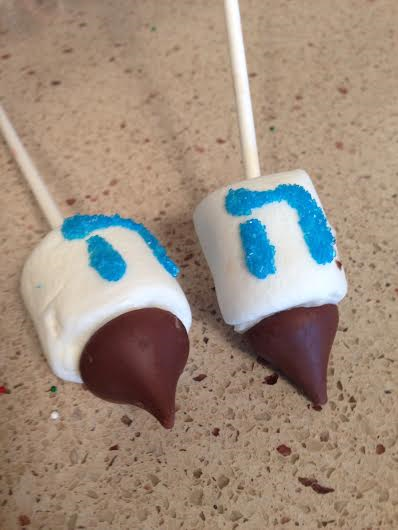 I love the dreidel treats. They are so delicious. To get the writing on the outside of the marshmallow use the Wilton White Icing Writer and then dip the writing gently into a shallow dish of sprinkles. I used blue crystals. 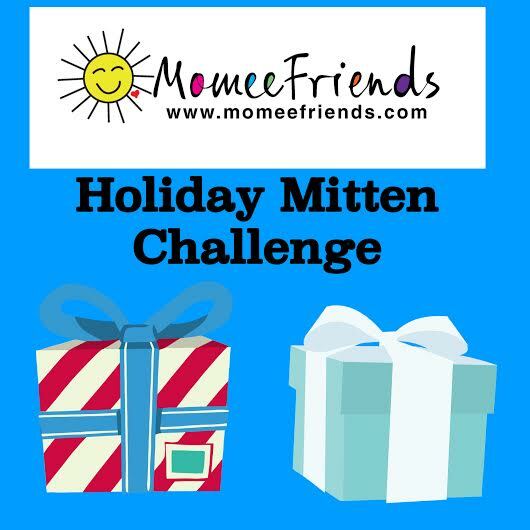 This game is one of many I will be sharing to do this holiday season. No matter what holiday you celebrate this game will bring smiles to the faces of those playing and those who are watching. 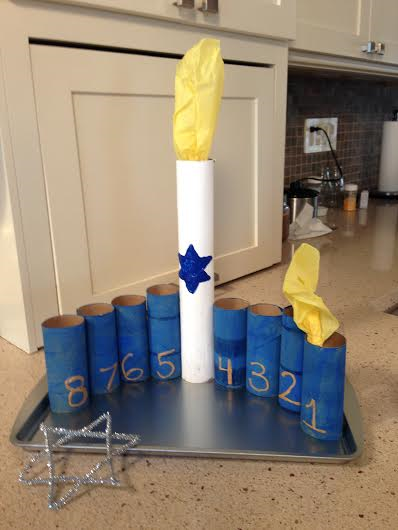 This is a great Hanukkah craft for little ones. Why? because there is no need for a real flame when you can use yellow tissue paper as your flame each night of Hanukkah. And just like the miracle of Hanukkah these flames will never burn out or burn little fingers. I also made a Star of David using silver tinsel pipe cleaners.